My previous encounter with ‘OpenMandriva Lx’ consisted of mixed feelings. It was not the fastest to boot, sometimes the system got stuck while booting & shutting-down, memory usage was also a bit high… but its KDE desktop responded really well when put under disk I/O stress. To put it into a simple context, there was definitely some room for improvements. The latest version, ‘OpenMandriva Lx 2014.1’ which got released recently, is basically a bug fixed update for the previous ‘2014.0’ and thus there are no major new features. And as a result, I decided to test it from a performance based perspective only. Note: After installing, I let the OS boot few times for letting things to settle down. 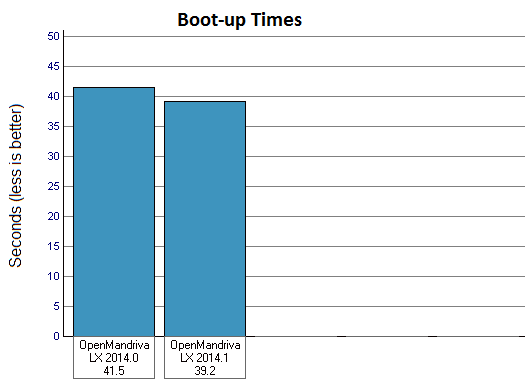 Specially because ‘OpenMandriva Lx 2014.1’ comes with the built-in readahead daemon (a tool that shortens the boot-up times) of ‘systemd’, and for it to work, it first needs to analyze the boot-up times, and that of course means that you have to boot the OS few times. I also took five samples of each test for obtaining average values, and kept the system in an ‘untouched’ state to for increasing the accuracy of the readings. The only changes I made included disabling the built-in ‘Welcome’ screen & enabling of the ‘auto login’ feature. So, without any further delay, below is the data. The release notes page says that the boot-up times are now set around 17 seconds!, but I think they are referring to the time the operating system consumes for providing the user with the graphical login window, from GRUB. To reach up to that point, it took about 19-20 seconds on my hardware also. However, when I say ‘boot-up times’, I am referring to the full system boot-up (from the GRUB boot-loader till the desktop gets fully loaded). As you can see, there is a 5% decrease in boot-up times in ‘2014.1’, though it is nothing quite significant. 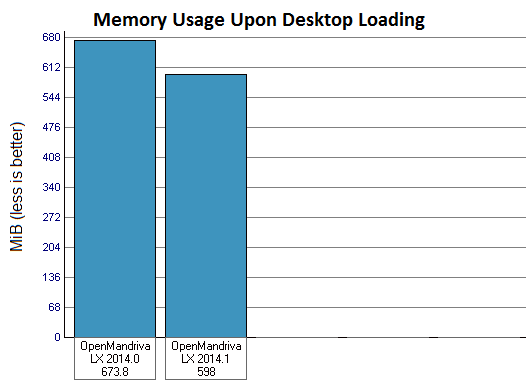 ‘OpenMandriva Lx 2014.1’ is however, about 11.2% memory efficient than its predecessor. Good!. When measuring the power, I let the laptop computer idle, after setting the screen display to its maximum value (dimming & screensaver features disabled…), Bluetooth turned OFF, Wi-Fi turned ON. 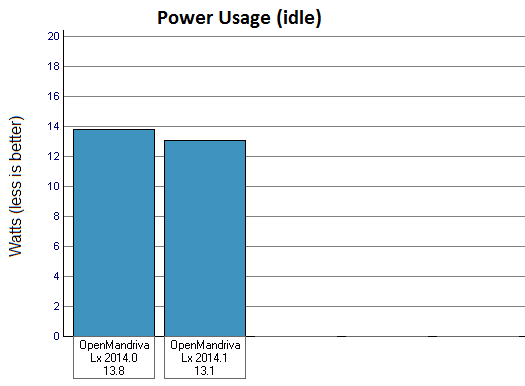 As you can see, ‘OpenMandriva Lx 2014.1’ used 5% less power when compared to the ‘2014.0’ release. However, if you can recall, back in ‘2014.0’, I could not turn OFF the Bluetooth adapter and thus it was turned ON during the power usage test. This time I was only able to turn it OFF once, and it just happened to be the instance where I was trying to measure the power usage. Now I know from experience that at idle, my Bluetooth adapter consumes about 0.5 Watts. So when you take it out of the equation, there is only a minor improvement and it is probably related to the Intel HDA (audio hardware) power-save features that is enabled in this release. I think including power usage optimizers such as ‘TLP’ or ‘LapTop-Model-Tools‘, at least through the online repositories, could have helped the mobile users. Update: Actually ‘Laptop-Mode-Tools’ is available in ‘OpenMandriva Lx…’, I my ignorance just only checked for ‘TLP 🙂 . Please read this article for installing and enabling it. CPU usage at system idle, as it was previously, was extremely low. 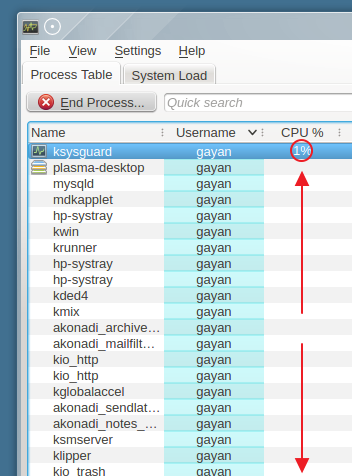 Only the system monitor itself kept consuming 1% of CPU time continuously. Pretty good. I measured the system’s responsiveness by trying to execute few somewhat memory hungry programs (I also involved VLC by trying to play a video) while a file (about 1.5GB) is being copied within the ‘Home’ folder. ‘OpenMandriva Lx 2014.1’, just like its predecessor, did not disappoint me. The programs got opened up before the file copy was finished, and video playback was also carried out without any major interrupts. However, when everything was finished, for a couple of seconds, there was an intense disk read/write which also interrupted the video playback, but it only lasted a couple of seconds. I ran this test 3-4 times (between each trial I rebooted the PC to clear the cache…) and there was this intense disk read/write operation in all these occasions, something that I have not seen before. Other than that, it was all good. P.S: VLC actually refused to play MP4 files and complained about not having the correct decoders. Then I re-installed it (‘urpmi vlc’) and it installed few additional packages which did the trick. 1. As mentioned earlier, I had issues with the Bluetooth adapter. I could turn it OFF once, and that was it. Then on, I could not turn it OFF or use it. This also happened in ‘2014.0’, with the exception that, as mentioned earlier, I could never turn it OFF. 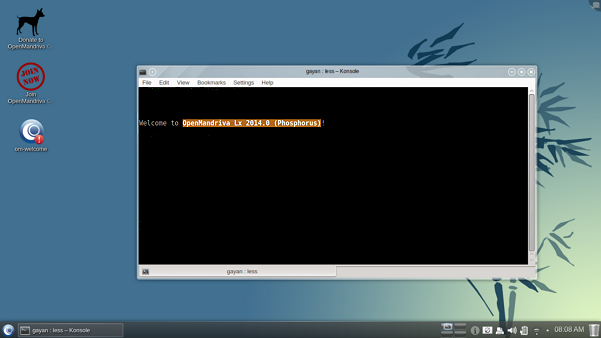 I have seen this in a couple of other recent KDE distributions, it is probably KDE related. 2. When my battery was charged fully, the tray icon went crazy 🙂 & displayed as it has zero charge left!. To fix it, I had to reboot the computer. *. My fingerprint reader is not yet supported by Linux, so there is no point of mentioning anything about it. Other than that, the rest of the hardware was configured and worked without issues. I could also manually set the screen brightness levels without having to worry of it being reset to its maximum at each desktop login. On ‘OpenMandriva Lx 2014.0’ my laptop used to get stuck (randomly) during system boot-up & shutdown. I am happy to say that it seems to have been fixed in this release as I have not encountered it (so far). Although it happens rarely, when shutting down the OS hangs up for about 12-15 seconds, but this time it at least recovers from it, and shuts down properly. Except for the above mentioned issue, the OS shuts down fast most of the time, and as you can see, it is marginally faster than ‘2014.0’ as well. 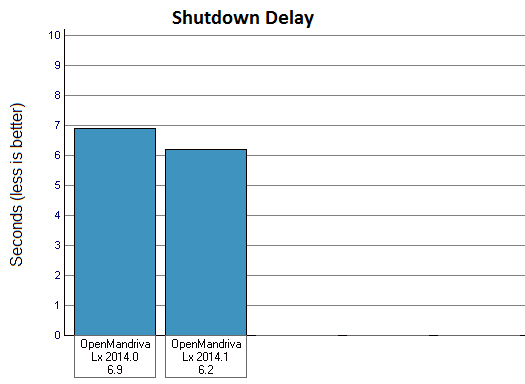 When compared to the ‘2014.0’, I would say that things have improved in ‘OpenMandriva Lx 2014.1’. But performance-wise, there are not a lot of significant improvements (except for the memory usage reduction). 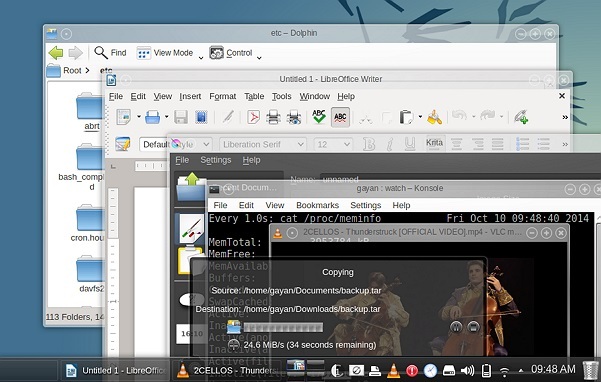 It still takes a slightly longer time to boot when compared to other KDE distributions that I have tested, and comes with a couple of network file sharing service such as ‘Samba’, enabled at boot-up, which most users would not going to need, that affect the boot-up times negatively. I disabled couple of these services & tweaked things a bit, and was able to reduce the boot-up times by 3-5 seconds. The total boot-up times afterwards were set around 35-36 seconds which is pretty fast when compared to most other KDE distributions. Also, even though the ‘mysql’ services are disabled (as far as I could see), somehow when loading KDE, a ‘mysql’ process that consumes about 82-83 MiB gets loaded which should further slow things down. I could not find what is behind it… it is probably ‘Amarok’ related (my best guess). However, some of those tools are necessary services if you have a small network at home for instance… but most other distributions do not include them by default. Then again, perhaps they are targeting a different audience. And, although most other distros too ignore tools such as ‘TLP‘ & ‘Laptop-Mode-Tools‘… everybody loves an OS that is power efficient, & after seeing what they can do, I think adding, or at least making them available in a software repository (or better yet, how about putting an option on the ‘om-welcome’ screen to enable them manually) would also be great & should work in favor of the OS. What I am trying to say here is that, if they can tweak things a bit more, then ‘OpenMandriva Lx’ has the potential of being a pretty good operating system. Anyhow, on the positive side, the OS also seemed pretty stable. So all in all, it is an improved release, and thus, if you are already an ‘OpenMandriva Lx’ user, then my humble advice is that you should upgrade (they actually advice you to perform a clean install as upgrades might drift you towards issues). But before doing so, please make sure to read this release notes page first as it contains few possible hardware & software related issues that might occur and a few possible fixes for them. You can download it from here. Good luck. Thank you for reading. I believe that the mysql process comes from Akonadi. You can try switching Akonadi to use SQLite, or else try to completely disable Akonadi. That makes sense, I’ll have a look into it, thank you!. SQLite backend has many lockups because it doesn’t allow concurrent modifications to the database. Try postgresql instead of mysql. It is as fast and scalable and its memory usage won’t go higher with time. I have been using the postgresql akonadi backend for a few months now and it is really great. Thank you for the suggestion Hussam. >>> 2. When my battery was charged fully, the tray icon went crazy 🙂 & displayed >>as it has zero charge left!. To fix it, I had to reboot the computer. Don’t blame OMV for this. Speaking about boot time, my system 4xPhenom with 8GB RAM and SSD disk boots 2014.1 in 6 seconds. Thank you NicCo 😀 . Sorry about the ‘Laptop-Mode-Tools’ mistake, I only checked for ‘TLP’. And about the ‘swapiness’ value, well, I run my GNU/Linux distributions without a swap file or partitions & while the I/O was talking place I had a look at the memory usage and it was actually below 1.3-1.5 GB… Anyway, thank you again for the corrections. Second we also introduced tuned (https://fedorahosted.org/tuned/), a daemon that tunes on the fly few kernel and hardware options to give maximum performance with balanced power consumption.